Going to the toilet seems to be an easy and normal routine for many people. However, there are those who are either recovering from surgeries or having difficulties walking who find the task quite grueling. Fortunately, finding a good commode is easy especially since there are plenty of them on the market. These products come in different sizes, capacity, design, and features. And if you are on the lookout for the best commode, then here are three products that might be worth a shopper’s money. Drive Medical, as its name suggests, is a manufacturer of medical-related products. Currently, it produces items for mobility, patient rooms, personal care, daily living and respiratory aids, pediatric rehab, and oxygen and aerosol therapy. These items also include hospital and clinic furniture, beds, walkers, and you guess it right, commodes, to name a few. 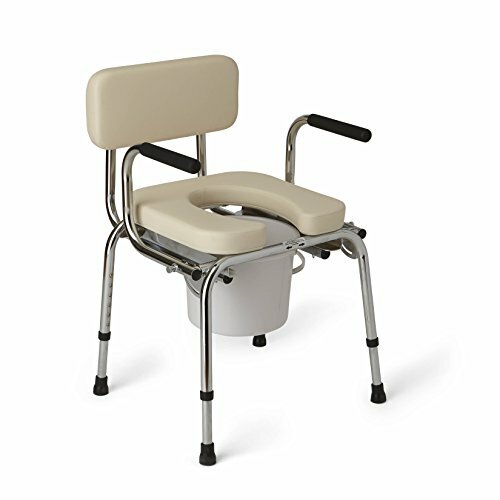 It presently has ten standard commodes in its line as well as shower commodes, drop arm commodes, bariatric commodes, and commode accessories. The Drive Medical Folding Steel Bedside Commode promises to be an easy-to-use commode. This product is made from durable plastic and coated steel. The frame is made from grey powder coated steel that has been welded for durability and strength. The seat is of durable plastic that has a snap-on seat and lid design. The width between arms is around 18 inches, and the outside legs are 22.5 inches. The arms are made of plastic and were designed for the safety and comfort of the user. The commode comes with a 1.5-quart bucket complete with a carrying handle for easy disposal of waste. The package also comes with a splash shield and cover. This commode measures 15 inches in diameter and 13.5 inches in width. The product also folds and opens quickly, which makes it portable. This is all thanks to the snap buttons that allow for opening and folding in just a few seconds. It can be folded flat for ease of storage and transport. The seat is a bit narrow. Medline is a global maker and distributor of Healthcare Products and Solutions. It has been in the healthcare industry for over a hundred years and has more than 18000 employees worldwide. The Medline Heavy Duty Padded Drop-Arm Commode promises comfort, durability, and ease of use. This product was designed to make it easy for patients who are in a wheelchair. The arms are adjustable, and one only needs to push a button to swing them down. It also features a foam-padded seat and back that’s resilient. The padded seat and back increase the patient’s comfort. The backrest is also removable if the commode will be placed over the toilet. The arm rail is covered with foam hand grips that will not slip even if wet. This commode can accommodate any patient weighing 300 pounds or less. The seat’s height is adjustable anywhere from 18.25 inches to 23.25 inches while the seat depth is 18 to 20 inches. The width between arms is 18.5, and its overall length is 22 inches. The package comes with a pail, splash guard and lid. The DMI Bedside Commode Chair claims to be a sturdy and heavy-duty commode. This product can accommodate as much as 500 pounds. It also boasts of being extra wide with a width of 23 inches while the width between its legs is 24 inches. Its depth measures 17 inches. Users can adjust the commode’s height anywhere from 16.25 to 23.5 inches. It comes with an easy-to-slide pail with a capacity of seven quarts. The frame is made from high-quality steel that is gray powder-coated. The product maker claims that the steel frame is both durable and easy to clean. The handles are also made from steel. The product also has wide supportive plastic to ensure comfort to the users. There are also slip-resistant rubber tips for its legs. The product weighs 19 pounds. It can also be used to fit over a toilet, which makes it a great product for those needing help getting down and up from an existing toilet. There are many commodes on the market that finding one may take time. Hence, we’ve also taken our time to provide you with a detailed review of these three fantastic products, which all claim to be comfortable, durable and easy to use. But do all these products deliver on its promise? 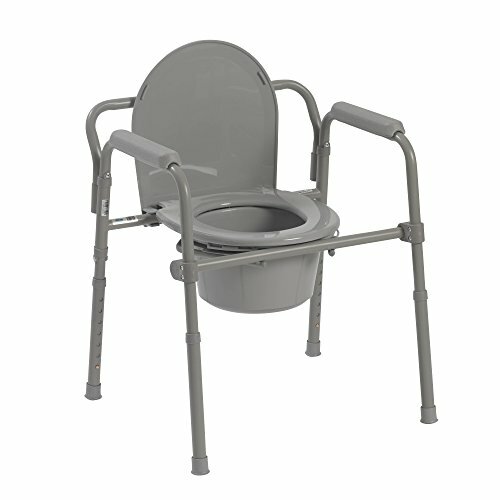 The Drive Medical Folding Steel Bedside Commode is different from the two other products as it is portable and foldable. On the other hand, the Medline Heavy Duty Padded Drop-Arm Commode is the only item in this review that has padding for the backrest and seat while the DMI Bedside Commode Chair is the only one that can handle 500 pounds. So, which is the best commode of this series of reviews? 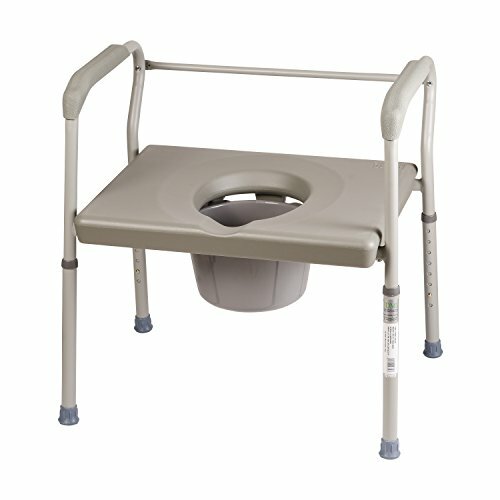 The commode from Drive Medical and Medline have the same capacity. If one is looking for a product for slender patients who value more comfort, then the latter should be chosen. Meanwhile, the DMI commode is good for those shopping for large commodes and is not too sensitive with a mess.